You know when you’re playing a racing game and you smash into the wall so hard that the game physics go a bit weird, sending the car into the air for a suspiciously long time? 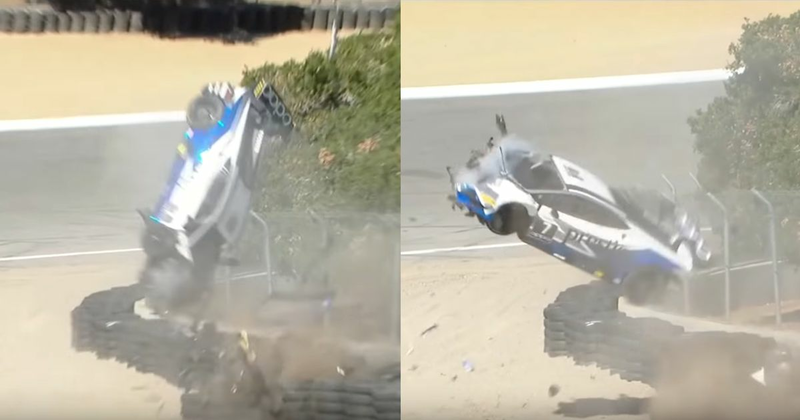 Well, that’s what this accident at Laguna Seca’s Corkscrew turn kinda looks like. Lamborghini Super Trofeo driver Sheena Monk, went into the wall - hard - flipping into the air and coming to an abrupt halt. “I have yet to review what happened with my accident yesterday at WeatherTech Raceway Laguna Seca but I’m extremely grateful for the safety and strength of the Lamborghini Super Trofeo. “I’d like to thank my family, my coach Katherine Legge, the team at Wayne Taylor Racing, IMSA, the track marshals, safety crew, Medi-vac unit, and the amazing staff at Valley Medical Center for assisting me in such tremendous fashion. Although the crash looks a lot like brake failure, Lamborghini reported that “all of the operating systems were found to be functioning appropriately”.